Myofascial release is a goal of structural integration (also known as Rolfing). structural integration (also known as Rolfing). So, let’s take a closer look at what myofascial tissue is and why it might need to be “released”. One definition of the word fascia is “a sheet or band of connective tissue covering or binding together parts of the body such as muscles or organs.” I would also add “bones” to that list, since there is actually nothing left uncovered, protected, bound and held together by fascia. The word “myofascia” is more descriptive since it indicates the three dimensional web-like nature of tissue that permeates our body from head to toe. This “endless web” is an uninterrupted soft structure that can be found in three inseparable levels in our bodies: Just below the skin (superficial fascia); deep fascia, which surrounds, intertwines and weaves right into muscles, around bones, arteries, vessels and all bodily structures; and very deep fascia which surrounds the nervous system, spinal cord and brain. Myofascial release can restore proper alignment and the interworking cooperation of this “endless web” of connective tissue. The myofascia is a complex arrangement of collagen fibers. It acts like a coil that can tighten and loosen, expand and contract. This design makes the whole unit very elastic in order to provide for the many complex moment by moment demands made by movement throughout the whole body. 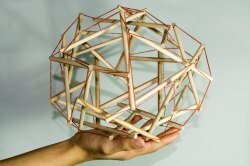 The picture to the right of a “tensegrity” model (from tension and integrity) illustrates how nothing but rubber bands and sticks can become a very elastic, but stable unit. This model represents the integral and highly elastic structure of the human body that is so dependent on the myofascial matrix for its structure and cooperative function. Remember, we’re not talking about muscles here. We’re talking about fascia that connects and holds the whole body together in its proper shape, form and function. If you think about it, bones are simply spacers amongst a very complex structure held together by the system of myofascia. Myofascia is structural! The bones never touch each other. They simply connect parts of the body together with ligaments and tendons. Myofascia holds and supports everything in the very precise, but elastic shape needed for optimal function. That is, unless something disrupts its complex design. The myofascial system sometimes develops localized “problem areas” that can become stiff, thickened, bunched, twisted, tight, knotty or sticky because of the many stressors of daily living. Its elasticity begins to suffer in these areas, causing unnatural “holding patterns”. A myofascial release therapist trained in structural integration can locate these problem areas. The therapist can begin to correct them through postural re-education and by actually manipulating the fascia itself, reversing these improper holding patterns. Injuries, surgeries and poor posture are just a few reasons why areas of the myofascial system can need a little help from structural integration therapy. The result is to allow it to operate smoothly again. Often, the fascial tissue gets out of place in certain areas of the body causing misalignment. The holding pattern might result in a shoulder being constantly higher than the other. Or, one side of the pelvis can become tilted out of alignment with the rest of the body. Pain, stiffness and poor bodily performance results to one degree or another because the whole alignment of the body is thrown off. Overpronation is an example of fascia not holding the foot in the alignment it was intended to stay in. Any time one part of the body is out of alignment, it is out of alignment with the entire body. As is mentioned on the Structural Integration page, if the body is not optimally aligned it begins to work against gravity, rather than cooperating with it. Myofascial release can reestablish that cooperative structural alignment through myofascial manipulation and movement therapy. The therapist will need to teach the client to move, sit and stand properly to avoid causing the myofascial areas treated to revert to poor alignment again. So, What Is Myofascial Therapy? A structural integration (Rolfing) practitioner is trained to detect fascial restrictions and to seek myofascial release through manipulation. Once problem areas are identified, he or she will use sustained pressure that warms up the fascia. This can take a few minutes in each area, so structural integration often takes several sessions. The slow movements and pressure of the therapist’s hands or arms begin to “melt” (soften) the fascia beneath. It is a slow process because every stroke in a different place has to start all over with the “melting” of the fascia in each area. Myofascial release therapy is like peeling an onion. The therapist goes through one stroke with a broad hand or forearm to get to superficial areas just under the skin. When that area is heated up and softened it can be moved around. Then a smaller area of the hand or elbow, etc. is used as a more precise, smaller “tool” to go deeper into core fascial areas. During the therapy the client might be asked to do some very slow stretching to help with the process. Structural integration is not really targeting the muscles, rather the fascia around and within the muscles. During most massage techniques the muscles are manipulated, but the fascia is unaffected. The fascia can remain just as tight, knotty or stuck as before, even after a long, relaxing, therapeutic massage. During myofascial release therapy the fascia is made more pliable. This is done using something called the “thixotropic effect”. Fascia, a normally fluid-like collagen tissue, can become sticky and turn into a gel when out of its proper position. The warmth and pressure described above “melts” the “colloid” tissue and changes its structure to become more fluid again. Depending on the size of the area being worked on, a forearm, fist, or fingers are held on the spot with as much pressure as a deep tissue massage, but without sliding. Eventually the tension on the spot will heat up the fascia just enough to make it pliable. Once it is pliable it can be moved and loosened. The “tool” (arm, hand, etc.) is held at a purposeful angle. When the fascia beneath it melts it will start giving way or giving in, letting go and melting like warmed butter. Once this pliable state is reached the therapist’s arm or hand will slide with it in a planned direction because of the angle applied. The myofascia underneath is relaxed and moved to where it should be, wrinkle and twist free. That doesn’t occur with massage. That is the essence of myofascial release; releasing the fascia so that it can be moved to where it should be by the thixotropic effect. The therapist gradually moves toward the deeper fascial tissues. That is what structural integration is all about. The connective tissue is manipulated and movement education seeks the goal of balancing the body to cooperate easily with gravity from head to toe. Pain is eliminated and proper motion is restored. The champion of the discovery of structural integration, Ida Rolf, said, "Put it where it belongs and call for movement." Return to Stuctural Integration page from Myofascial Release page.